I bought my X120e back in March of 2011. That makes me what most people would probably call an early adopter. I saw the Brazos previews in November, and decided that I really couldn’t put up with my decrepit Pentium M based ultra-portable laptop any more. I wanted graphics; and a chip that would allow me to play Battlefield 2 seemed like the perfect upgrade from an Intel graphics chipset that didn’t have drivers for Windows 7. I wanted battery life; my five year old laptop lasted about three hours on a good day when I surfed the web in Chrome and took notes on lectures in OpenOffice. The battery just barely held in there long enough to make it though all of my classes, which is why a laptop with five plus hours of battery life seemed so attractive. I wanted a small form factor, my old laptop had a 10.1” screen, which made it a little bit smaller than my math text book. The X120 offers a 11.6” screen, which is still about the size of a text book. I also wanted the nicest keyboard I could get for the lowest price possible. My old ultra-portable had a less than usable keyboard, if it wasn’t me hitting two keys at once with my rather large fingers, it was the extremely sticky keys getting jammed into the keyboard. I couldn’t stand it. As a college student price was a major concern. 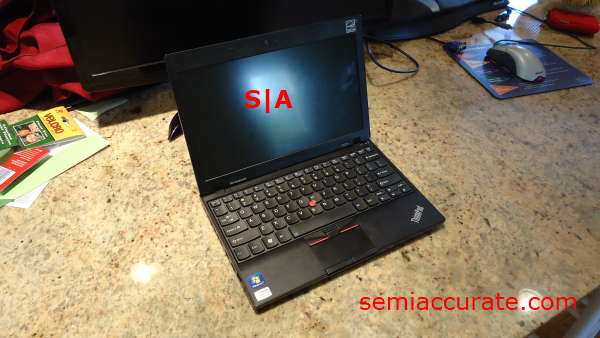 When the X120e had been initially announced at a price of $399 I was extremely pleased. Unfortunately, Lenovo plays the same game that all of the major laptop OEM’s do. So while I was expecting a X120e with 4GB of RAM, a 6-Cell battery, and an E-350 under the hood, what Lenovo was actually offering for $399 was a step down in all of those dimensions. 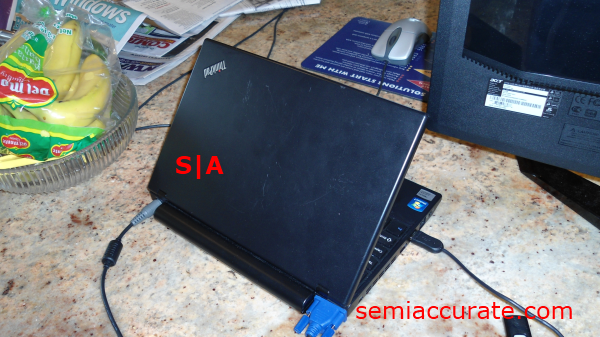 Still an X120e with 2GB or RAM, a 3-Cell battery, and an E-240 is a more compelling platform that one of ASUS’s Atom and Ion based Eee PC’s. 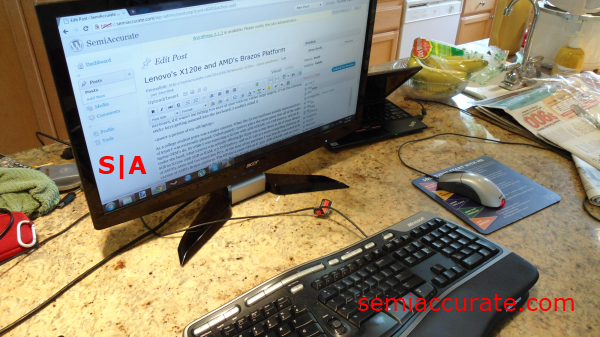 But at the time of my purchase I was heavily interested in HP’s version of AMD’s Brazos platform. The HP dm1z came with an E-350, 3GB of RAM, and an ever so slightly longer battery life than the X120e. But the X120e won out due to two major factors, the keyboard, and the build quality. Lenovo’s Thinkpad line has always had well received keyboards with the exception of some reviewers disliking the landmark red Tracpoint joystick and touch-pad configuration. The X120e ‘s keyboard is particularly good. I wouldn’t go so far as to call it the best keyboard in the 11.6” class, but it’s without a doubt the best keyboard on any Brazos or Atom based system on the market. With generous keys that are about the width of a USB flash drive, dual shift and control, and a dedicated function key, the X120e’s keyboard has the kind of quality that all of it’s competitors should be trying to achieve. But enough of me babbling on about the single feature that makes it superior to a tablet, let’s look at the build quality. During my ownership of the X120e it has handled pretty much all of the physical damage I’ve accidentally or otherwise subjected it to. Only one piece of it has fallen off and that was the piece of rubber on the right hand side of the monitor that was designed to cushion the impact of the lid onto the base of the X120e. I absent-mindedly scratched it off while listening to an accounting lecture one day. Accounting lectures having been known to do worse to others; this seems minor. But other than that my X120e hasn’t anything else come off of it. Admittedly its matte plastic finish is a bit scratched up now. But when you’re in a situation with indirect lighting, like a Starbucks for instance, the black color and matte finish will hide any abrasions. The touch pad on the X120e is probably the weakest feature on the machine. 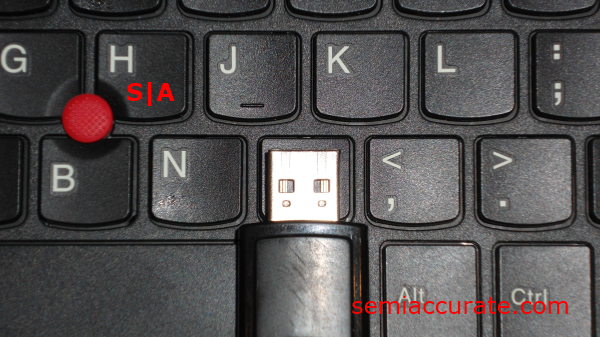 It provides adequate single finger cursor sensitivity, but dragging your finger up or down the right hand side of the track-pad to use the scroll feature that most laptops support results in some very bumpy and exaggerated movements; to the point where I’ve quit using the feature. Which, was a staple for viewing web pages on my old laptop, and switched to using the arrow keys which are conveniently located on the bottom right hand side of the keyboard. After searching the Lenovo web forums for a bit I learned that the user is suppose to use the Track point in combination with the scrolling button located at the top of the touch-pad, but I have yet to work this feature in to my web surfing routine as using the arrow keys seems to be more efficient. The other odd thing about the touch-pad is dual sets of right and left mouse click keys. They both have the same function, and the lower set is easier to use when web surfing, despite being the smaller of the two sets. I suppose that they would be more useful if I could work them into my typing routine using my thumbs, but as is probably all too clear right now, this is my first Thinkpad. The screen was another major selling point for me on the X120e. It’s an 11.6”, 1366 by 768, Matte, LCD. All of the characteristics of this screen are pretty pedestrian except for its lack of a glossy finish with allows the X120e to separate itself from most of its competition like the HP dm1z. I use the X120e on my bus ride home quite often, and I have to say that the matte screen really improves the usability of the platform in variable light situations. The only issues with it occur when the screen gets dusty and then the light reflects off of the dust particles on the screen and form what one might call a layer of visual interference. The view angles are nothing special and neither is the screen brightness either, but the screen is still well within the usability spectrum despite those flaws. Battery life on the Brazos platform is at worst average and at best completely unnoticeable to the user. I when you unplug the X120e from its charger, it will report somewhere between 3:40 and 5:30 of time left before the 6-cell battery runs out. Under actual usage conditions I tend to get between 4:30 and 5:45 of battery life. As a side note, Lenovo’s battery utility is a fickle application that sometimes will report less than an hour of battery life left when it’s 96 percent charged, and alternatively report 23 plus hours of battery life left when awakened from standby. The one interesting feature that Lenovo’s utility offers is the maximum battery life power profile which does a fairly good job of extending your battery life when below a 20 percent charge. Lets talk about the the drivers for the X120e. Not to be an apologist, but let me start by saying that it’s gotten a lot better since I first received the X120e. The first few graphical driver revisions for the E-350 had some issues, like video playback stuttering, and every time I tried to run the original Crysis it would crash on launch. The other annoying issue that came up repeatedly was the audio/visual stuttering issue that would rear its ugly head every 10 seconds or so, and made the same noise that your desktop does, when you overclock it a bit too far, and it crashes. It wasn’t annoying enough to make me irate or stop whatever way playing, but this issue didn’t really make the X120e a great HTPC platform. Luckily this issue was resolved by a recent BIOS update and everything seems to work fine now. HD video playback via Media Player Classic – Home Cinema and VLC is very smooth and the audio quality is good since the BIOS update. As such I’ve started using my X120e as an HTPC to run my projector and 5.1 surround system. Overall it works quite well; there are only two issues with it. First, when I plug the X120e into my projector via a VGA cable it doesn’t auto detect the projector and I have to force it to detect the projector through the VISION Engine Control Center. Second, because the equipment I’m using doesn’t support HDMI I have to use the 3.5mm audio jack for my 5.1 system, needless to say I don’t get 5.1 support when using this setup, which is a minor annoyance. Overall though the X120e is a competent HTPC or presentation machine if you can live with its limited, but understandable, options. About half of the time when I’m using my X120e I have it plugged into an external Acer P224W monitor running at 1080p through VGA. It’s a setup that seems to work pretty well. Occasionally when I plug the X120e into it it will display at 1366 by 768 rather than 1080p but that can be fixed by disabling the X120e’s built in display through the creating and arranging desktops tab within the Control Center. Although, it should be noted that doing this will occasionally cause a blue screen; which is oddly enough the only conditions I ever encountered a blue screen on the X120e. It’s hard for me to say if this is an issue with the drivers, or with windows, or maybe even with the X120e; at this point I can’t say one way or another. But this issue only occurs every 5 to 7 times I disable the internal display. Now that I’ve covered all of the issues I ran into with the X120e, I can say that the most helpful place other than Google was Lenovo’s support forums. Specifically this thread by KGr_ss that covers most of the issues you could run into with the X120e. Thanks to KGr_ss for his contribution to the X120e community. Heat and noise are two problems you don’t have to worry about with the X120e. While audible after long periods of time, the single fan on the X120e is neither annoying or intrusive. The fan makes a low level sound that I would associate with air movement; it’s mostly a mid range sound that doesn’t contain any high pitched wines or low pitched reverberations. The center of the keyboard surrounding the space bar is probably the warmest part on the keyboard surface of the X120e. It is a noticeable warmth, but not an uncomfortable warmth, and it can actually ease typing especially on rather cold days when your typing while waiting at a bus stop, for example. The area on the backside under the mid to upper right hand side part of the keyboard also gets warm, but no warmer than the topside. Configuring the X120e on Lenovo’s website was one of the most time intensive part of buying this laptop. I had a limited budget to work with, and every dollar that I could save would help me else where. So I wanted to get the maximum value for my money out of the X120e. As such I configured my X120e with the E-350 which was an upgrade from the base model which offered the anaemic E-240, which is often beat by the C-50, and 2 GB RAM instead of 4GB, because they wanted an extra $70 dollars, when a 2GB stick of SO-DIMM DDR3 1333 is a little over $20. I also opted to go with the cheapest hard drive they offered because Lenovo had failed to offer a small capacity SSD, think 40 to 120 Gigabytes, as an option in their configuration menu. The total cost was about $450. Since my purchase a number of things have changed in Lenovo’s configuration menu. Adding 4 GB of RAM is now an $80 upgrade, and now there is only one hard drive option to choose from, instead of the 3 options there were before. The silver lining to that change is that before the base model came with a 5400RPM hard drive, and now it comes with a 7200RPM drive. Oh, and there still isn’t an SSD or no OS option for those who would install Linux immediately. In any case, and despite a number of simple missteps by Lenovo on the back-end and a few teething problems, the X120e is a very good laptop that I would buy again. X120e does well in key areas like build quality, keyboard quality, screen glare resistance, and upgradability. Hopefully we’ll see prices go down on all of the Brazos based systems when Llano comes to market in the near future, whenever that might be.